Welcome to the Golden Dragon Virtual Tour!! 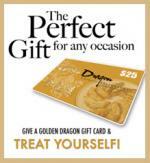 At Golden Dragon, we strive to provide every customer with a unique and wonderful experience upon each and every visit. To attain our goal, we are always seeking and developing new innovative ways to better serve our customers. We hope that our constant improvements will bring exceptional value to your overall dinning experience with us. In keeping our promise and staying true to our heritage, we will carry on our tradition of providing wonderful tasting food, at an exceptional value and great customer service to everyone. Welcome to the Golden Dragon! ___ABOUT CHINESE FOOD__ It is not easy to brief the civilization of Chinese Food in a short message, it is because, there are more than 56 folks inside the Mainland China, and the large area causes difference dining habits among the difference districts. First of all, we need to know that, the old China was developed in a faming society, and most of the dining habits and meals culture are based on this factor. Dining Tool and habits Not same to the people living in western area, Chinese used to have their dinner together with all the family members, sitting around a table and each person will have one set of dining tool in front of them, including two bowls which one for rice and another for soup, one pairs of chopsticks and one plate for meat / vegetable. They will share the food dishes which were made and put into the central of table, diners will only pick up the food from the dished which who want to eat. He will pick it and places it into the small plate in front of him. There are 2 special habits, one is, Chinese diners never pick up rice from the bowl but will handle the bowl towards their lips then poke the rice into their mouths by the chopsticks. The other one is, Chinese always have soup during or after dining. Traditional Chinese Food There are so many traditional and special Chinese foods, according to the folk culture, district, religion, and festival. For the famous classes divided by district, there are style of Guangdong, Beijing, Shanghai, Sichuan, North-West, and so oniKor by folk, there are kajia, Yunan, Fujian, etc. These all above mentioned styles are well-known in the worldwide. Here, introduce some special dishes, perhaps you have had it, or you have never heard : Doufu Doufu is the most popular food in Chinese Society. It is also the main food in a faming family. Major Ingredients : Bean curd, Yunnan Ham, Black Mushrooms Steamed Fish Chinese always make the fish recipes by steaming style. Just only with some light soy sauce and some seasoning. Major Ingredients : Snakehead, Preserved Lemon, Spring Onion Dim Sum Dim Sum is the most famous food in world-wide. It is a Guangdong Style snack which served as light meal. Major Ingredients : Shrimps, Pork, Wheat Flour for pastry Lobster Lobster is the famous style seafood in Hong Kong. Some difference from the traditional western chef's style.. Major Ingredients : Lobster, Chicken Stock, Garlic Dark Rice Vinegar With Ginger You perhaps have never heard this.....this is Guangdong style. It is a supplementary diet for women who is weak, new mother. Ingredients : Sweet Dark Rice Vinegar, Pig's Hands, Egg, Ginger Eggs In Tea This is a very special snack of Guangdong.. It is very nice food for the party, gathering, with beer. Ingredients : Eggs, Chinese Dark Tea Festive Dishes Because of the poor and hard lifestyle character of a farming society, the Chinese farming families would have food which were being get from the farming field, such as, potatoes, tomatoes, vegetable, sweet corn, mushrooms, etc. So, the Chinese will have many dishes of meat recipes like Chicken, Pork, Fish that they do not have in the normal days. The are some special snack, or to be said, festival food will be made during the Chinese festivals, Such as Sweet-Stick Cake and Turnip Pastry in Lunar New Year, Glutinous Rice Tamale in Dragon Boat Festival, Moon Cake in Middle Autumn Festival, etc, and Steamed Buns to the Birthday personikik Religion Culture - Vegetarian Diets Buddhism and Tao is the main religions in Mainland China, and, it is must more simple to know that vegetarian diets becomes the main food to the people whose cult as monk and nun, as well as Taoist. There are so many vegetarian diets made looked like meat as pork, beef, fish, cuttlefish, etc. It is so funny and tasty, and healthy. Islam is one of the large religion in Mainland China, but it is well-known that, the Muslins never eat Pork, and their famous recipe is BBQ Lamb Main Food Generally, we can divided the farming products of main food in China into 3 styles, those are, Rice in Southern and Eastern China, Wheat in Northern China and Sweet Corn in Middle, Northern, Western China. Because of their farming products, the people living in Southern China will have rice, congee or rice noodle as their main food, and who will have wheat made products like Bun, noodle, pancake in Northern China. The populace who living on seaside and lakeside will have seafood or lake fishes as meals. Of course, people can have any food as they want nowaday. Taste Depends On Climate There is a big difference about the diets between Northern and Southern China, that is, the dishes made by Northern Chefs are in heavier taste and those are comparably light in Southern Chefs' recipes, sometimes, we say it is tasty as sweet and fresh in Southern Chinese food. In the Northern and Western Provinces of China like Lingxia, hebei, Sichuan , Shenxi, and Yunnan, the diets are made in hot and spicy, because of the humid cold weather and high altitude, Chinese people wonder that to perspire is a good method for preventing diseases caused by humidity and cold. Herds And Spices, Preserved Materials There are not popular to use herds and spices in Chinese Food, perhaps Chinese chefs will use some parsley, aniseed, fennel, cloves, Sichuan peppercorn, red chili pasty, however, they mostly use light and dark soy sauce, Shaoxing wine, rice vinegar and oyster sauce as the main seasoning and sauce. Chinese chefs usually like to use the preserved and salty Ingredients like preserved eggs, potherb and pickled mustard, dried shrimps, bean curd cheese, dry and salty pork, salty duck, meat sausage Kit is a long and traditional habit since the ancient hard and poor farming society.